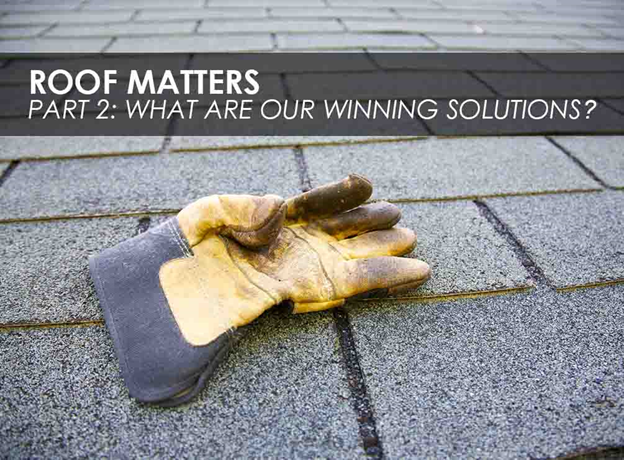 Roof Matters, Part 2: What are Our Winning Solutions? Home / Roofing / Roof Matters, Part 2: What are Our Winning Solutions? Slate tiles are unparalleled when it comes to structure. They live the longest among roofing materials, which is a statement to their superior durability and weather resistance. With proper installation, a slate roofing system is proof against rain and snowmelt. It prevents moss and algae growths because it doesn’t retain moisture as much as other types of roofing. Slate tiles can also stay in place securely against high winds and are non-combustible. They may still require repairs at some point, but regular inspection would keep you ahead of any damage. Slate is captivating for its timeless beauty. It’s the traditional choice for many vintage homes, but they suit contemporary styles, too. Asphalt offers the perfect balance among beauty, efficiency, durability, and affordability. This type of residential roofing in Maryville, TN, emulates the authentic look of wood and slate at a fraction of the cost. An asphalt roofing system is easy to install, budget-friendly, and low-maintenance. These shingles are lighter than slate tiles, so they wouldn’t require extra structural support and labor. Metal roofs are tough enough to withstand rough weathers. Any experienced contractor would say that metal roofing could last up to 50 years with proper maintenance. It comes with cool features that help keep your home from overheating. As a trusted roofing company in Maryville, TN, we offer an array of colors and textures to meet your unique aesthetic requirements. We can even install it over your existing system, forgoing the tearing off and disposal of your old roof. Check out the first part of this series to learn why you need to replace your old roofing today. You can also call Innovative Roofing and Siding at (865) 444-6070 to get your free estimate.